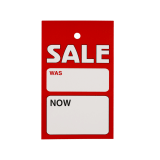 Use a Sale Price Swing Ticket to promote discounts and reduced prices in your shop. The label has an enticing red design with a large white space for you to write in your new and reduced product price. A swing ticket is more likely to be spotted by customers, inviting them to browse your sale products more closely. Where can the ticket be displayed? The ticket has a 3mm punch hole at the top where you can thread a string through to hang onto items. It can also slot onto a clothes hanger. You could also use a tagging gun to fix the label onto certain goods. What material is the label made from? The swing ticket is on 250gsm uncoated paper. What size is the swing ticket? Each ticket measures 7.5cm W x 10.5cm H.
How many tickets are in each pack? The tickets are supplied in packs of 500.